Founded in 2001, PTK SPORT is the leading manufacturer of a wide range of swimming pool and water sports equipment in Russia. PTK SPORT company is a federal-level enterprise with dealer outlets across Russia and partners in France, Finland, Kazakhstan and Belarus. Our factory, situated in St.-Petersburg, is equipped with state-of-the-art high standard machinery which coupled with meticulous hand-craft and rigorous testing, allows us to provide our customers across Russia and neighbouring countries with exceptional quality and give them complete confidence in their swimming pool equipment. Company-owned manufacturing areas, advanced technologies and annual investments in new machines and equipment result in a large production volume and low manufactruing costs that enable us to offer you competitive prices and volume discounts. PTK SPORT product range consists of starting blocks and starting platforms, lane lines and reels, pace clocks and scoreboards, backstroke flags, training equipment, locker room and pool furniture, assisted access equipment and many more. Since 2014 the company also offers services in design and construction of stainless steel swimming pools and spas. 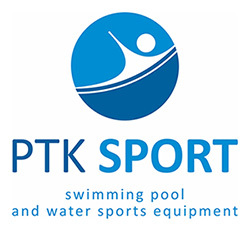 Having an established reputation for high standard construction and innovative technologies PTK SPORT in cooperation with Russian Swimming Federation annually designs and produces new models of training equipment for competitive swimming and aquatic exercise. We look forward to meeting and cooperating with new partners across Europe for mutually beneficial business relationship. All prices on our website are shown in Russian rubles (RUR), VAT included. If you have any further questions, please don’t hesitate to contact us by e-mail info@sport-spb.ru or call our office by phone +7 (812) 702 17 70.